Aizawl, May 13 : The toll in yesterday’s landslide at Laipuitlang in Aizawl mounted to 14 today, spurring the Mizo National Front to demand the resignation of chief minister Lal Thanhawla, who is also the state’s PWD minister. As the rescue efforts entered the second day today, four more bodies were located in the rubble. One of them, that of Zakir Hussain of Karimganj, was extracted. Another squall stalled efforts to extract the other three bodies. Hussain was alive yesterday and even talked to friends and relatives over his mobile phone. Later he complained of having difficulty breathing and couldn’t be contacted again. Rescue workers pulled out his body from the rubble around 2 this morning. Another youth, Lalrinsiama, was rescued alive from the rubble. But his sister Lalthafeli and brother Lalrindika were not so lucky. While Lalthafeli’s body was found, Lalrindika is still missing. “‘I love you’ were my brother’s last words. The phone went silent after that,” Lalrinsiama said, remembering those few minutes after the landslide when his brother called him from another room of their collapsed house. “Keep shouting for help no matter what,” Lalrindika had told him moments before that and he did exactly that, till rescuers heard his voice and came looking. Another survivor, Lalhlimpuii, was also rescued today with serious injuries. The director of the department of disaster management and rehabilitation, Lalpeksanga, told The Telegraph that five persons had been rescued since yesterday and 11 bodies recovered till 2 this afternoon. Three more bodies had been located but these could not be extracted as another squall stalled rescue efforts. He said six persons were still missing. There is, however, no official word yet on how many people may have been there in the affected houses at the time of the disaster. L.R. Sailo, press secretary to the Mizoram chief minister, said the state government had so far sanctioned Rs 40 lakh — Rs 25 lakh for Aizawl and Rs 15 lakh for other districts — to compensate those who had lost their property in the landslides. He said the government would decide on the quantum of aid within the next couple of days and then make a formal announcement. A police official in Aizawl said personnel of the State Disaster Response Force and the Mizoram Armed Police had been engaged in the rescue efforts, while the Young Mizo Association (YMA) is supervising the work. The association’s Laipuitlang, Chaltlang and Ramhlun branches have set up notice boards and information booths to help relatives locate the victims. Aizawl citizens are seething with anger, as they know yesterday’s tragedy was far from being a “natural disaster”. 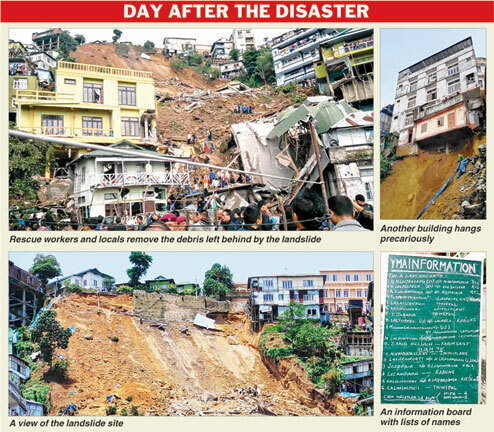 The imposing five-storied PWD building, which doubled as quarters for some staff, had been in a precarious state since last monsoon, when earth below its foundations had broken away and the subsequent landslide had blocked the road in the area. The building’s residents immediately shifted out and neighbouring house-owners also moved to safer places, as no one knew when the unstable structure would come crashing down the hillside. Though it was expected that the PWD and other authorities would immediately dismantle the building, nothing happened till heavy rain made the inevitable happen yesterday. Sources said local council officials had even written to the PWD and the Aizawl Development Authority to dismantle the building, but action came too late. The government ordered a magisterial inquiry yesterday, after the damage was done. The youth wing of the Mizo National Front today demanded resignation of Lal Thanhawla, who holds additional charge of PWD, for der-eliction of duty and for not do-ing anything to dismantle the damaged PWD building. A pall of gloom has shro-uded Mizoram, with news of death and loss of property in four days of rains and landslides trickling in from various parts of the state. According to reports, over 500 houses have either been partially or fully damaged in the eight districts in the past four days, as heavy showers triggered major and minor landslides. People in Aizawl today mourned the victims of the Laipuitlang tragedy during Sunday church service while a section of the state’s facebook users posted images of similar disasters waiting to happen.